We are pleased to announce that James Green has joined the PANGAEA team. James is a U.S. Army veteran and brings broad knowledge of network switches and routers as well as CAT 5/6 and fiber optic cabling. James was most recently a Network Technician for Charter Communications. Previously he worked for Asymmetric Warfare Group and General Dynamics. James lives in Landrum, SC and has an AAS degree in Computer Information Technologies and holds certificates in Cisco routing and switching. Congratulations to Tom Roberson of City Computer. 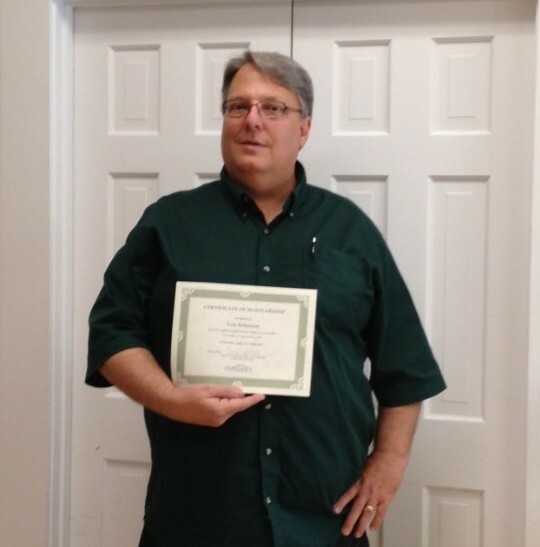 Tom applied for and received PANGAEA Internet’s $750 scholarship to attend a 4-day Fiber Optic 1-2-3 training course this month. Prior scholarship recipient, T.J. Byers says this about his current career, “I left my job at the Facebook Data Center back in May of 2017 to pursue a new opportunity. I was hired directly to work for the Data Center Management team of Amerisourcebergen, a pharmaceutical distribution/wholesale company. I am responsible for the daily operations of the Charlotte Data Center. I am also involved with building out our Visual Data Center and have been on the team that set up our remote monitoring for our sites. I am also responsible for scheduling Preventative Maintenance for our cooling units and UPS systems. PANGAEA Public Wi-Fi is available in many downtown areas of Polk & Rutherford counties including Harmon Field and Lake Lure Beach. Since 2015, more than 850,000 users have accessed the free public networks. who received a $200 Invoice Credit! See what Lee and other customers have to say on the Testimonial Page of our website. We recently completed a network upgrade that doubled our supply of internet bandwidth to meet the demand of our fast-growing family of customers. 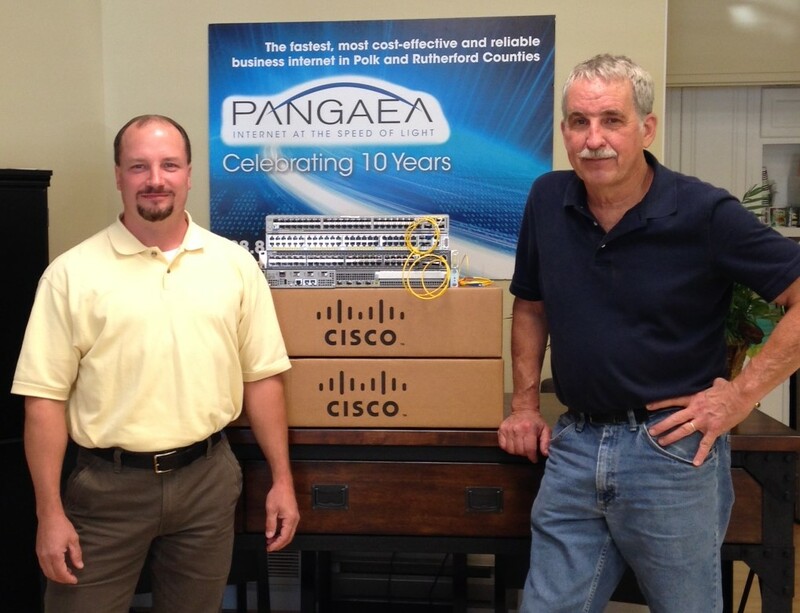 Pictured below is PANGAEA’s Network Engineer, Ken Griffin (left) and our Operations Director, Stu Davidson. 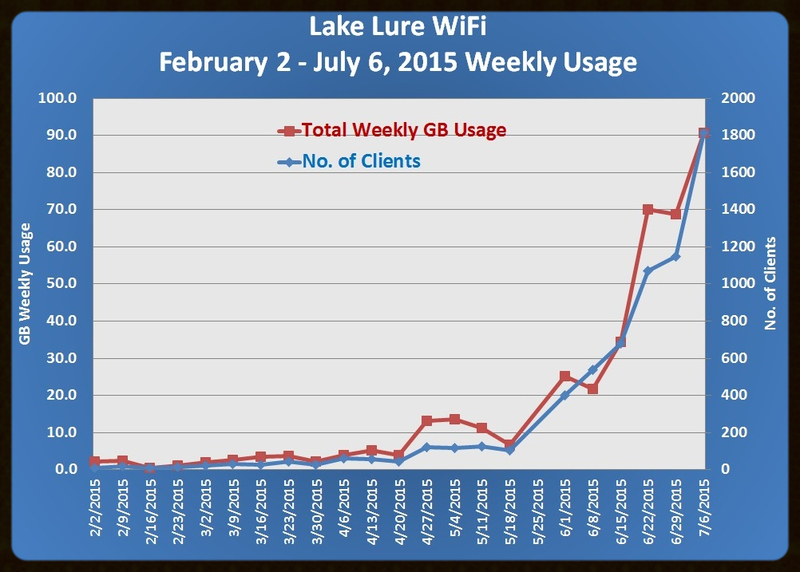 Wi-Fi usage has far exceeded expectations. The original target was 18,000 annual users. Since the project inception in 2015, more than 500,000 users have accessed the networks. PANGAEA Wi-Fi is available in many downtown areas of Polk & Rutherford counties including Harmon Field and Lake Lure Beach. 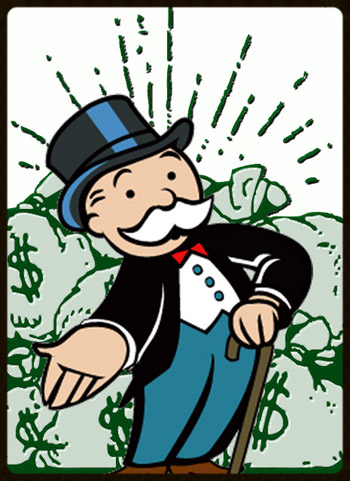 Congratulations to Michaila Cowles of Huckleberry’s Restaurant who received at $200 Invoice Credit! See what Michaila and other customers have to say on the Testimonial Page of our website. Fiber cables are a green technology. We can all do our part and fiber optic cables are no different. 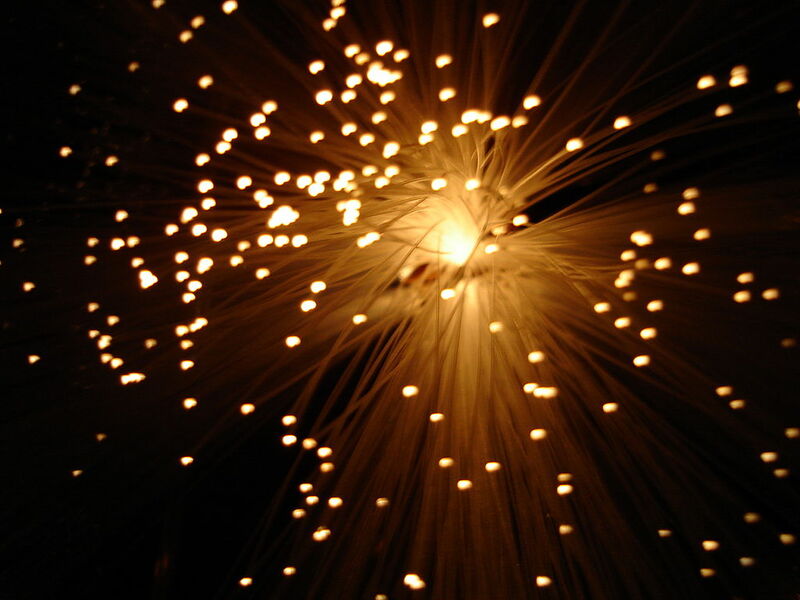 The amount of energy it takes to send a flash of light across a fiber optic cable is significantly less than that required to send electrical signals (copper cables). Less energy means less carbon output, lower emissions and greener operations. 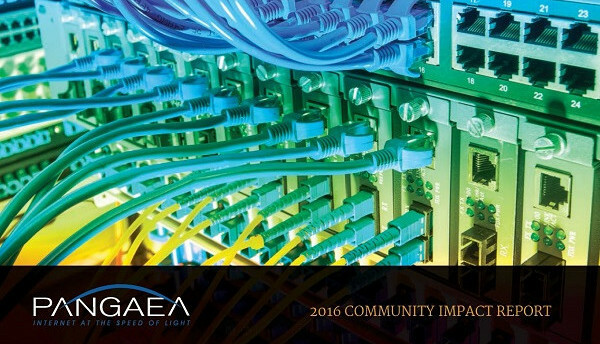 Click to read about PANGAEA Internet’s mission, community impact, partnerships, and customers. PANGAEA Public Wi-Fi is available in the downtown areas of Chimney Rock Village, Columbus, Lake Lure, Saluda, Tryon and also Harmon Field. 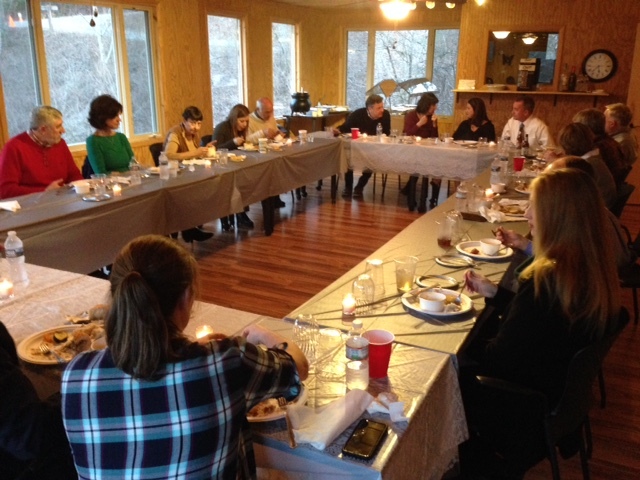 PANGAEA Internet’s board and staff enjoyed an evening to celebrate the many milestones reached over the past 14 years. 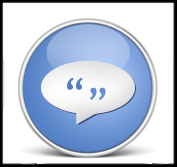 See what Lonnie, Dana and other customers have to say on the Testimonial Page of our website. Each fiber optic strand is 1/7 the diameter of a human hair and capable of transmitting 250 million phone conversations per second. 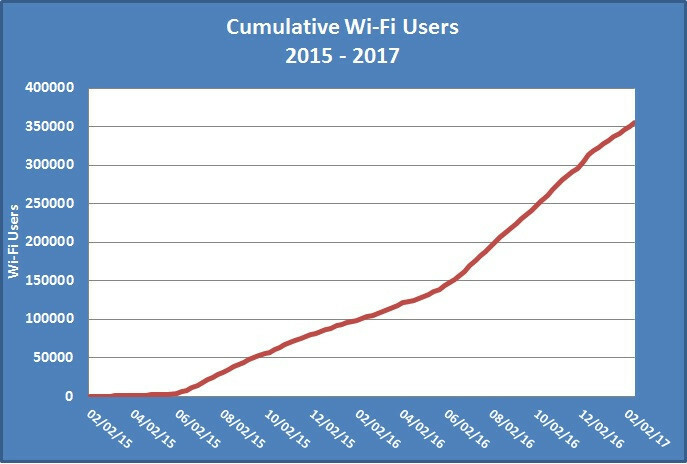 TRYON, NC / November 8, 2016 – The recently completed PANGAEA Internet Public Wi-Fi deployment has far exceeded expectations in both coverage and usage. 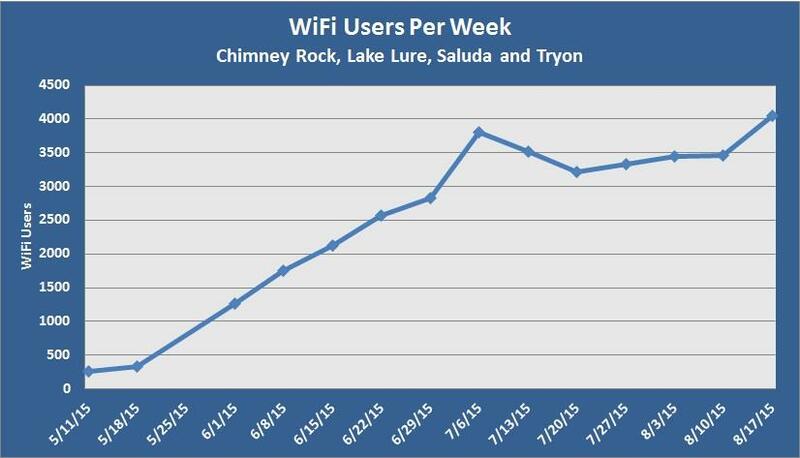 The systems, which provide free public Wi-Fi internet service via 57 access points in Chimney Rock, Lake Lure, Saluda, Columbus, and Tryon, served nearly ten times the projected number of users in 2016. 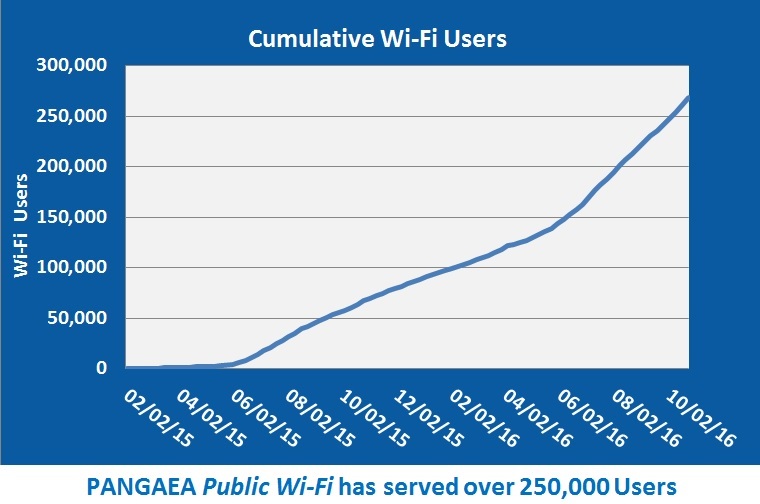 The PANGAEA Public Wi-Fi project exceeded expectations in two ways. First, PANGAEA built a prototype system in Tryon before applying for and receiving a grant from the Appalachian Regional Commission. Efficiencies developed during the prototype phase enabled PANGAEA to design and build the original three systems under budget. Therefore an additional two markets were added to the project. Total project costs were about $60,000 and the Towns and PANGAEA contributed grant matching funds. Second, Wi-Fi usage has far exceeded expectations. The original target was 50 daily users or 18,000 annual users. 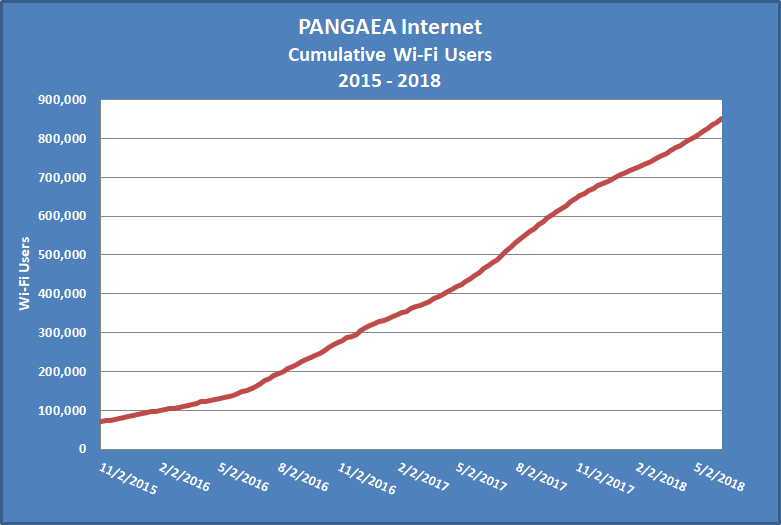 Since January 1, 2016, PANGAEA Public Wi-Fi has served 144,000 users. Since the project inception in 2015, 268,000 users have accessed the networks. PANGAEA Internet has partnered with the towns to provide public Wi-Fi for casual and temporary use – not to replace existing residential or business internet service. 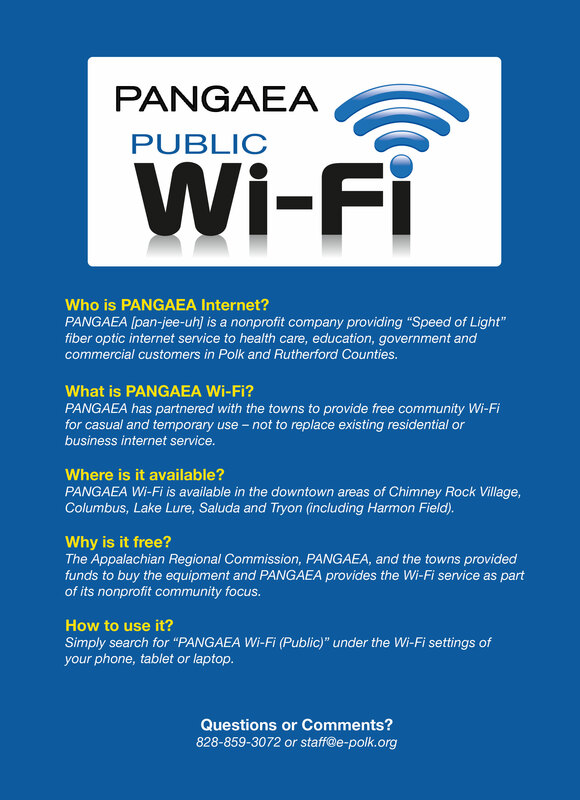 PANGAEA Wi-Fi is available in the downtown areas of Chimney Rock Village, Lake Lure, Saluda & Tryon. 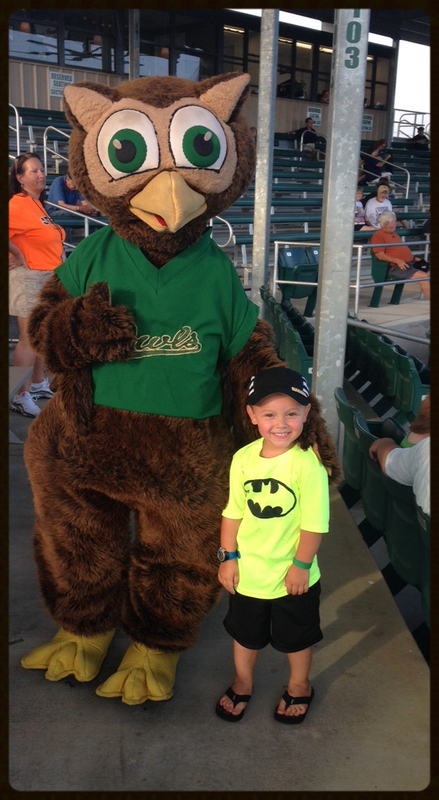 Coming this summer to Harmon Field and Columbus. 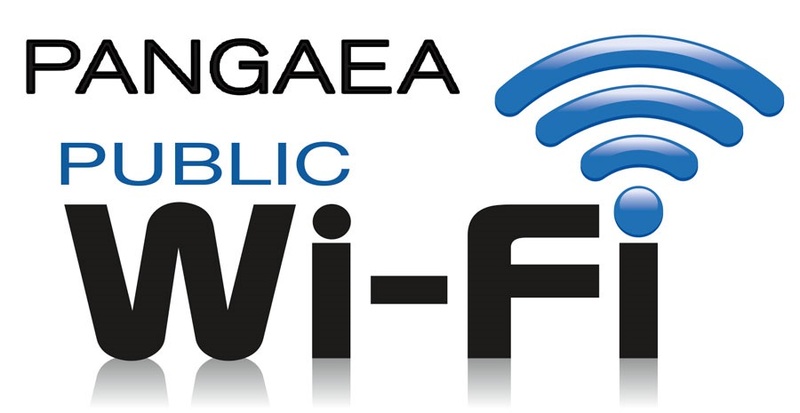 Look for “PANGAEA Public Wi-Fi” under the Wi-Fi settings of your phone, tablet or laptop. Click here to read our informational card. PANGAEA Internet is available to all commercial customers that are near our fiber route (see our Network Map). If a referral from a current PANGAEA customer results in a signed service agreement, we will provide the referring person with a $75 Amazon gift card!!! 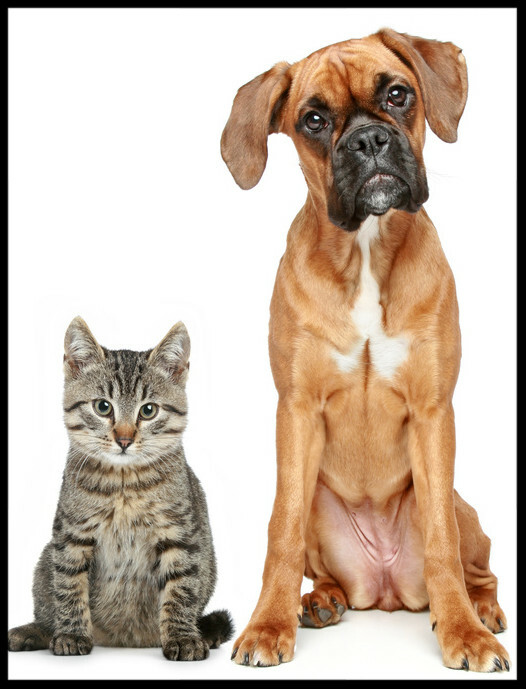 Click here to submit your referral. The “VAN-GAEA” has arrived . . . If you spot the “VAN-GAEA” in your area, text a photo to staff@e-polk.org and we will send you a colorful PANGAEA T-Shirt! PANGAEA Internet is offering scholarships to Polk and Rutherford county residents to attend Fiber Optic Splicing training to be held July 19 – 22, 2016 in Spartanburg, SC. See what Tom and other customers have to say on the Testimonial Page of our website. 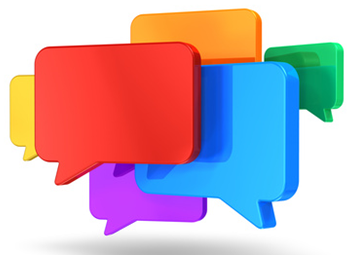 If you haven’t already submitted a customer testimonial, please take a few minutes and give us your feedback. Just click this link and provide a few sentences regarding how PANGAEA Internet has impacted your organization. The drawing is conducted quarterly. TRYON, NC / April 13, 2016 – As part of its continuing commitment to enhance economic development and improve the quality of life in our community, PANGAEA Internet (PANGAEA), the leading commercial provider of high-speed fiber optic internet service for Polk and Rutherford Counties, is preparing to expand its efforts to deliver Public Wi-Fi in the PANGAEA service area. 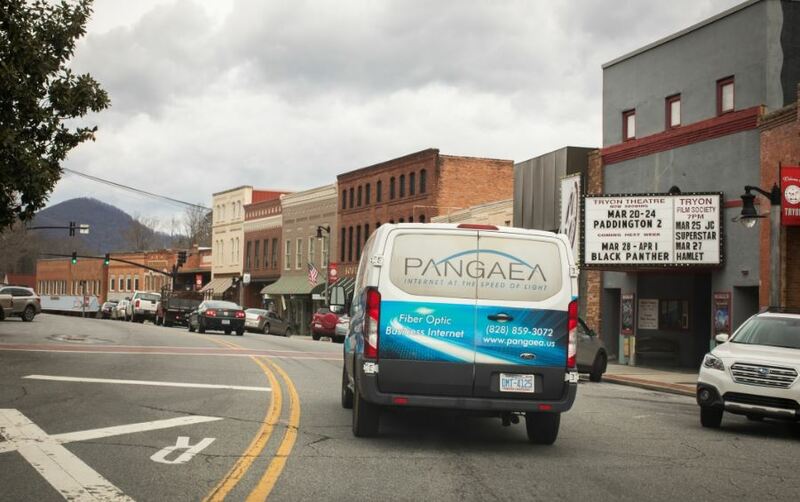 After a successful pilot project in downtown Tryon last year, a grant from the Appalachian Regional Commission (ARC) enabled PANGAEA Public Wi-Fi to expand to the downtown business districts of Chimney Rock Village, Lake Lure, and Saluda. This network expansion was completed on March 31st with such efficiency that grant funds remained, allowing PANGAEA to extend Public Wi-Fi to downtown Columbus and Tryon’s Harmon Field. Work on those projects will begin this summer. 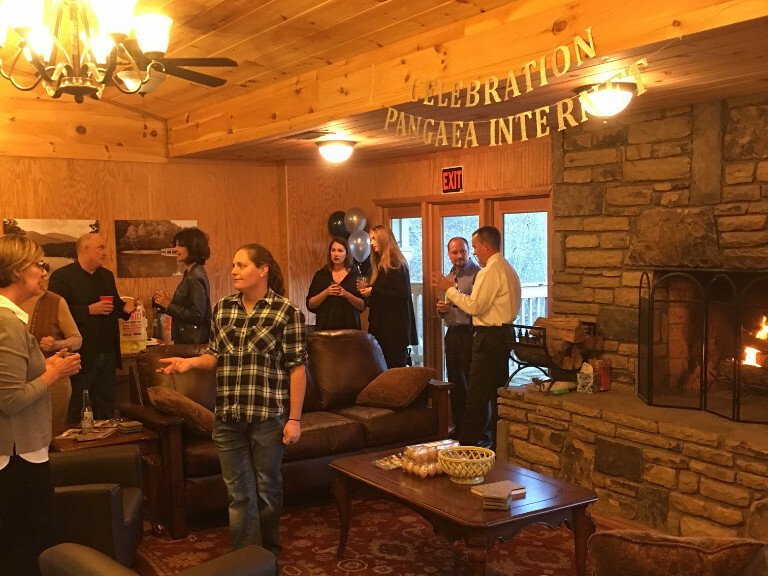 “We are pleased to bring PANGAEA Public Wi-Fi to Tryon, Chimney Rock Village, Lake Lure, Saluda and soon to downtown Columbus and Harmon Field,” said Ron Walters, Executive Director of PANGAEA Internet. “By coming in under budget on the initial network, we are able to extend the network to these additional locations.” Walters pointed out that there is no charge to use PANGAEA Public Wi-Fi in any of the areas where it is available. PANGAEA Public Wi-Fi is made possible by a partnership between ARC, the Towns, and PANGAEA to purchase and deploy the equipment necessary to build the network. PANGAEA provides the ongoing Wi-Fi service as part of its nonprofit community focus. 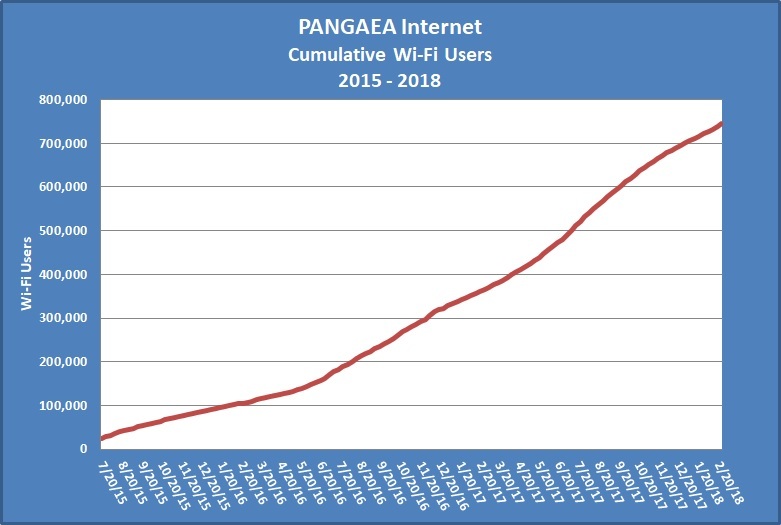 Currently, PANGAEA Public Wi-Fi averages over 2,500 users per week. The network is prepared to support increased usage as warmer weather brings an increase in tourism to the region. Residents and visitors to these communities can access the network by simply selecting “PANGAEA Public Wi-Fi” from the Wi-Fi settings of their phone, tablet, or laptop. 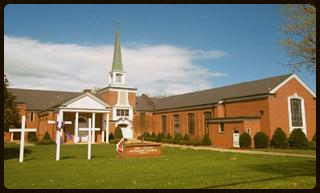 After selecting “continue,” users will be transferred to the Towns’ web page. 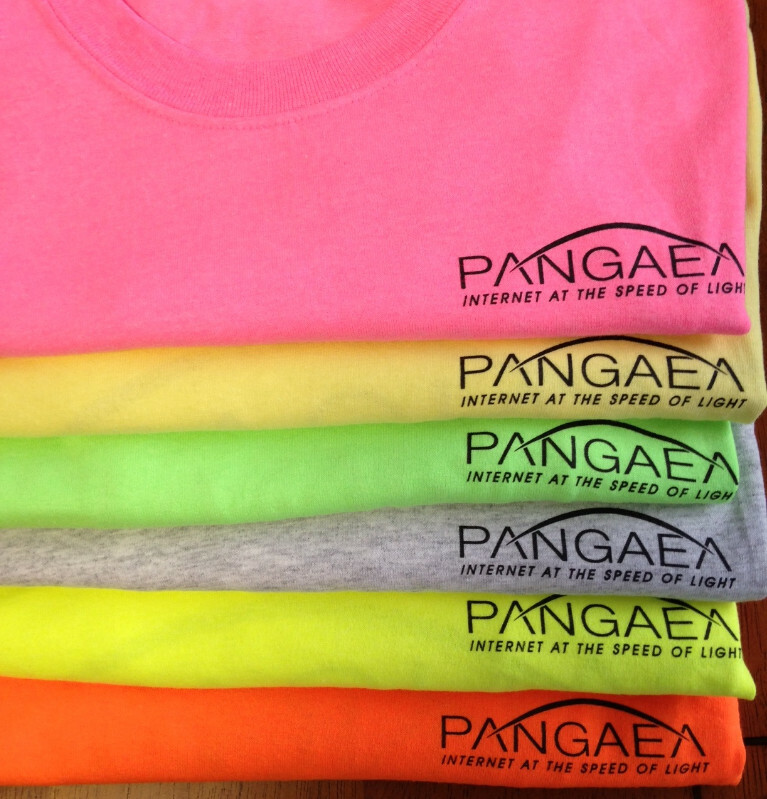 PANGAEA Internet (pan-GEE-ah) is a non-profit provider of “Speed of Light” fiber optic internet service. 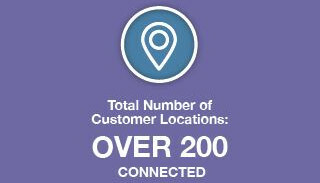 Our network currently serves customers at more than 150 locations across Polk and Rutherford Counties, including public school districts, city and county governments, health care facilities, and local businesses. 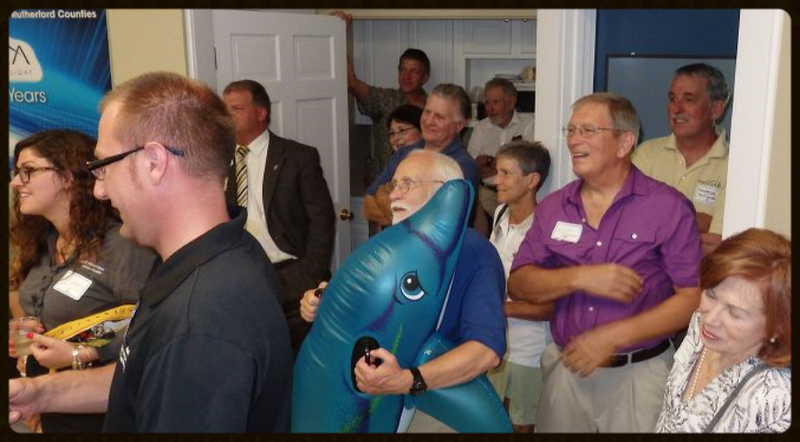 Visit us online at www.pangaea.us, or contact Executive Director Ron Walters at 828-859-3072. 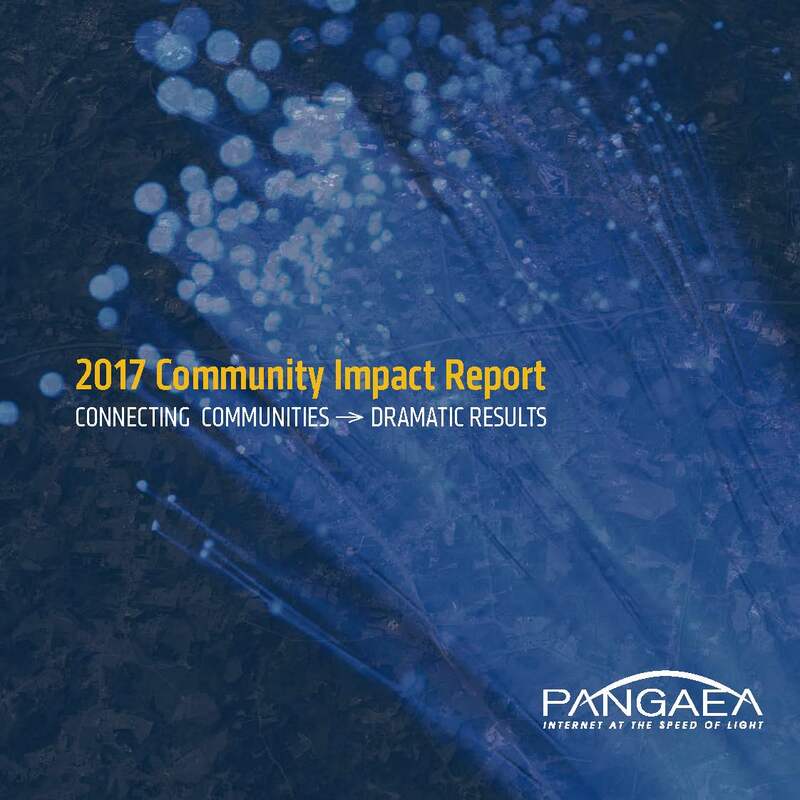 Read more about PANGAEA Internet’s community impact, Wi-Fi and network projects, board members and more in our 2015 Community Impact Report (click here). Fiber is good for the environment. The requirements to send an electrical signal over miles of wiring is typically dozens of times the amount of energy needed to send a brief flash of light over the same distance via fiber optical cabling. A lower energy requirement means a lower carbon footprint and lower price of operation, which can be enjoyed by network owners and their customers alike. 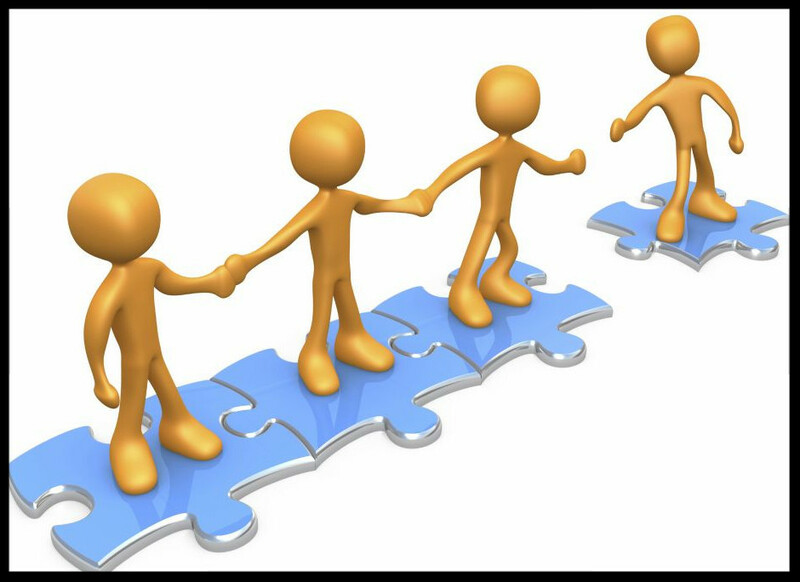 PANGAEA Internet will launch an exciting new customer referral program on April 1, 2016. Program details are coming soon. Both are recent recipients of a PANGAEA Internet grant. 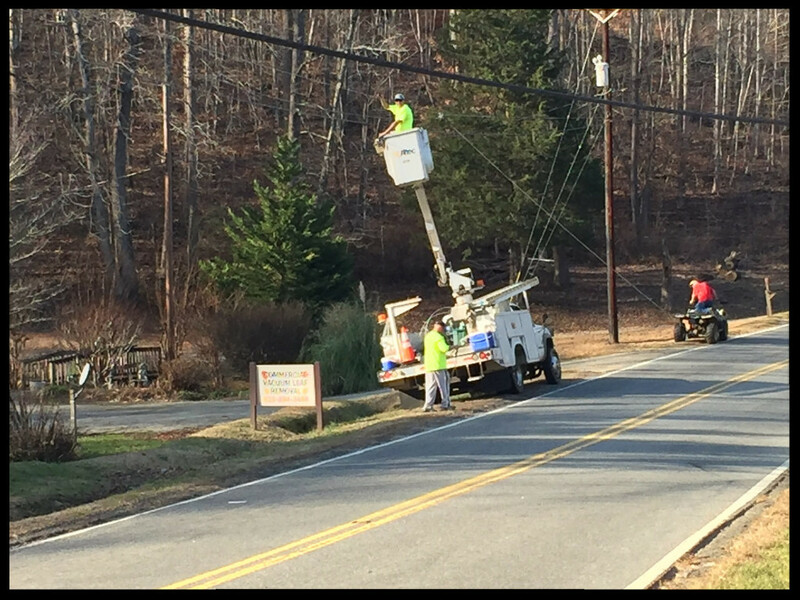 The grant funds assisted with installation costs for our “Speed of Light” fiber optic internet service. Read more about this program and submit an application on the Grant Application page of our website. See what Richard, Keven and other customers hav e to say on the Testimonial Page of our website. 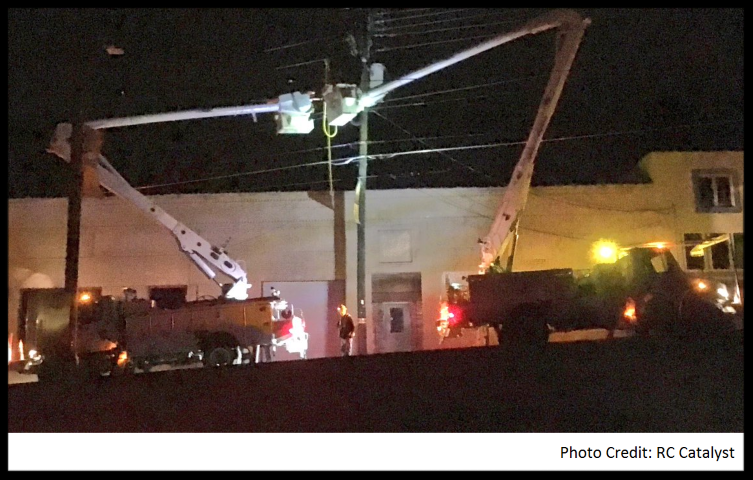 Installation of aerial fiber along Highway 108 in Columbus has been completed and PANGAEA can now serve additional business customers between Polk County High School and Dr. Lonnie Lassiter’s Office in Columbus, NC. Two new customers are already enjoying our fast and reliable service: Midway Baptist Church and Jay’s Lawn Service (Avery Creek Nursery). makes virtually unlimited speeds possible! 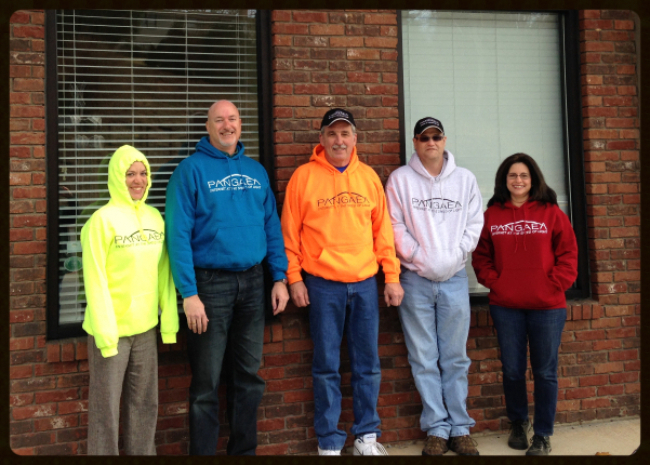 TRYON, NC / March 3, 2016 – In December, 2015, PANGAEA Internet (PANGAEA), the leading commercial provider of high-speed fiber optic internet service for Polk and Rutherford Counties, awarded scholarships for two local individuals to receive training in fiber optic splicing at a four-day course in Spartanburg, SC. The training has already made it possible for one of the recipients, Mr. T. J. Byers of Forest City, to launch a new career. 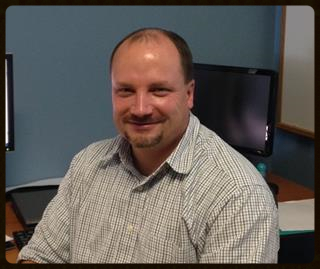 Mr. Byers was hired as a communications technician with Integrated Electrical Services. “Taking this class taught me the basics and gave me a competitive advantage because I knew how to terminate, splice and test fiber,” said Mr. Byers. 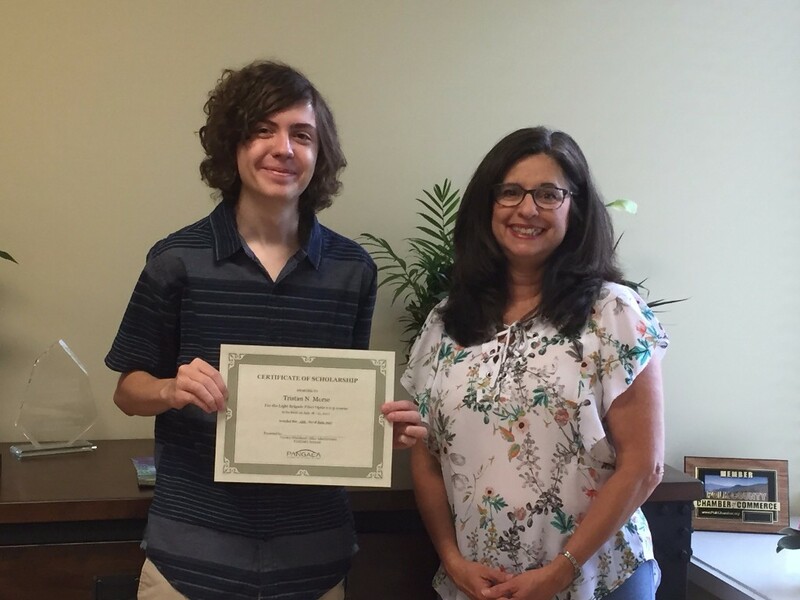 “I hope to advance my career and pursue leadership opportunities in the future.” Byers also said that the course provided him with a strong foundation of the skills required to properly design, install, and maintain a fiber optic network. 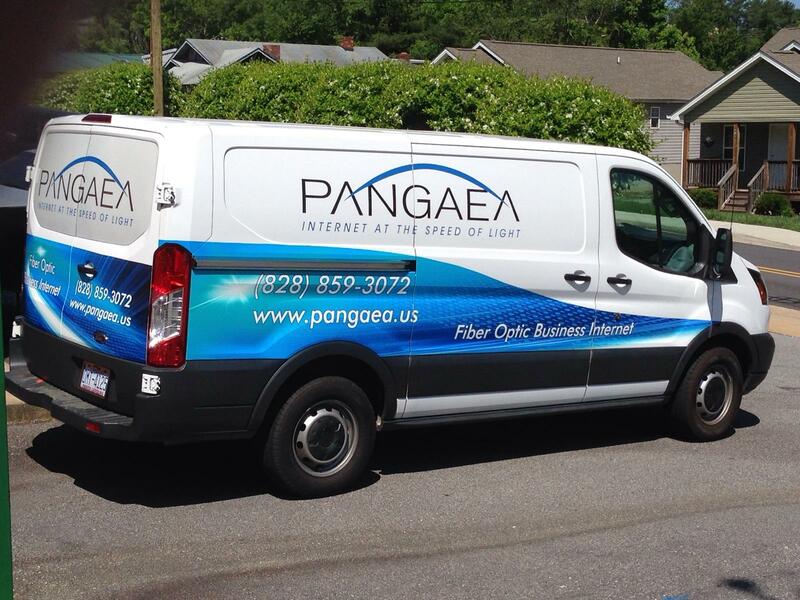 According to Ron Walters, Executive Director of PANGAEA, fiber optic splicing technicians are in short supply in rural areas such as Polk and Rutherford Counties. “This shortage impacts the ability of internet service providers, telephone companies and cable companies to install, maintain, and repair their fiber optic infrastructures,” said Walters. The scholarships provided by PANGAEA gave recipients the opportunity to complete the fiber optic splicing training course, as well as earn professional certification through the Electronics Technicians Association. 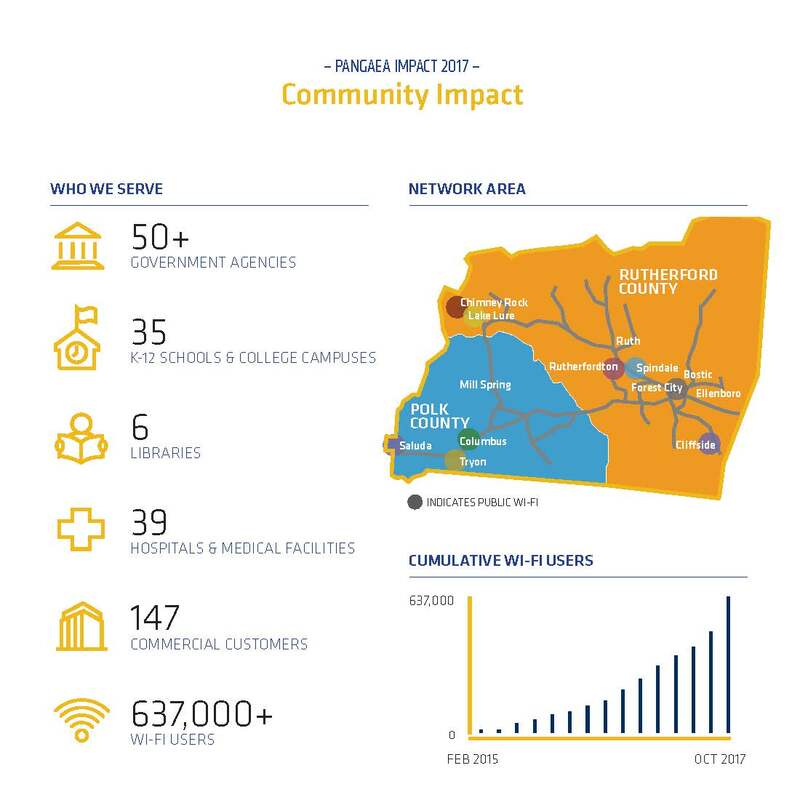 To learn more about PANGAEA’s non-profit mission to deliver affordable, reliable connectivity and services to our region, visit www.pangaea.us. 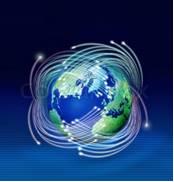 PANGAEA Internet (pan-GEE-ah) is a non-profit provider of high-speed fiber optic internet service. 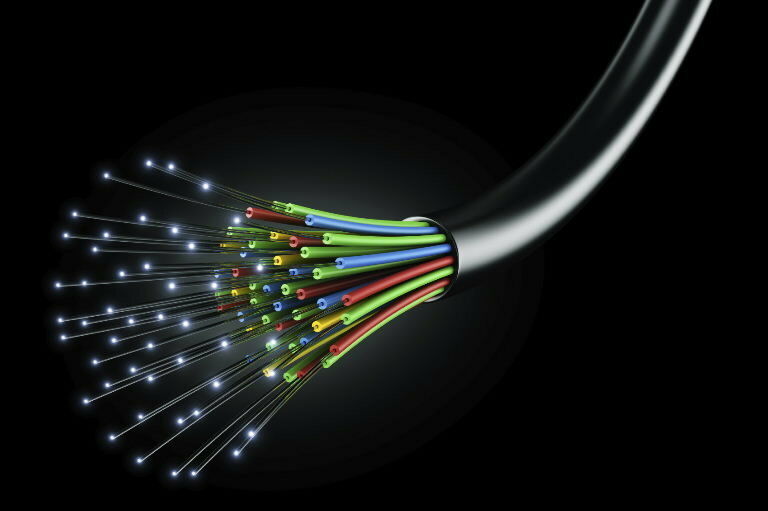 Our network consists of 240 miles of fiber optic lines and currently serves 130 customers across Polk and Rutherford Counties, including public school districts, city and county governments, health care facilities, and local businesses. 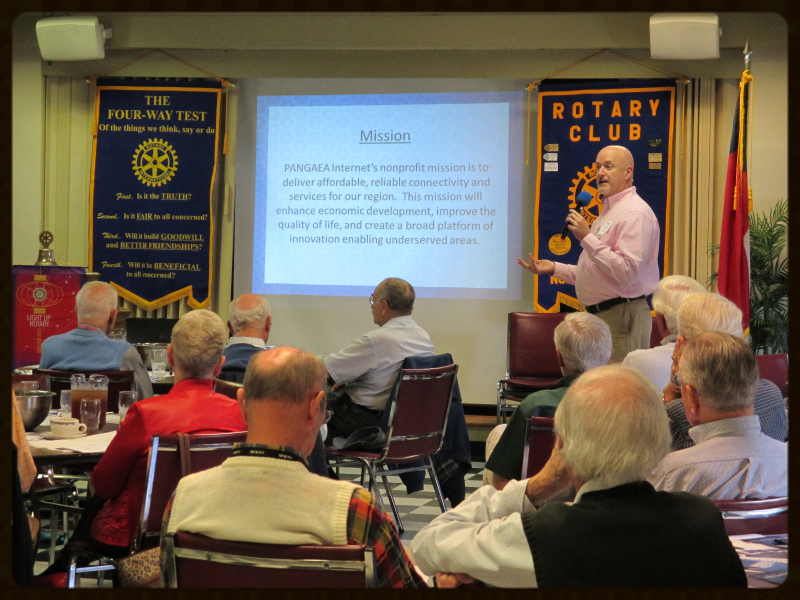 Visit us online at www.pangaea.us, or contact Executive Director Ron Walters at 828-859-3072 or ronw@e-polk.org. Want the Potential to Earn Up to $86K/Year? 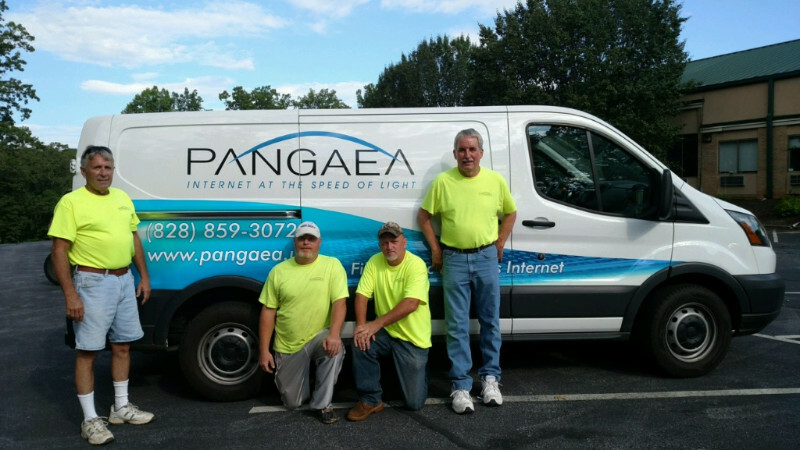 PANGAEA is a nonprofit internet service provider in Polk and Rutherford counties and is offering two scholarships to attend Fiber Optic Splicing training on December 14-17, 2015 in Spartanburg, SC. This four-day class has been developed with 16 hours of classroom and 16 hours of hands-on skills labs to provide practical understanding and skills required to properly design, install, and maintain fiber optic networks. PANGAEA is successfully deploying free Wi-Fi in our local communities. Click here to read more about this exciting project. When it comes to bandwidth, fiber is king. 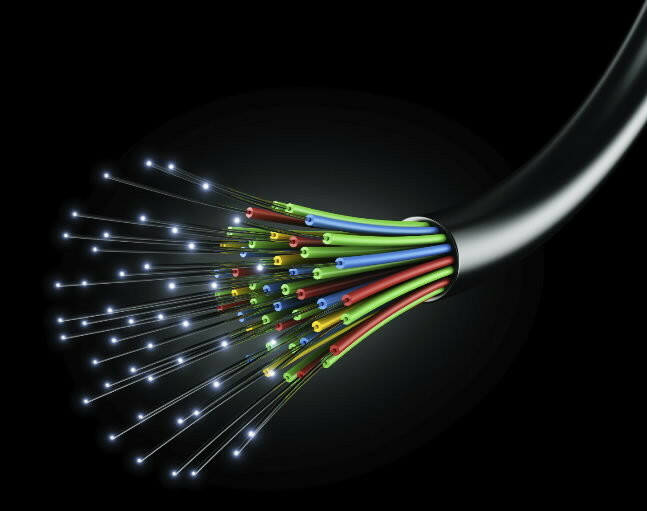 A single fiber is capable of transmitting 250 million phone conversations every second. One mile of fiber weighs about one quarter of a pound, whereas copper cable with the same information-carrying capacity would weigh 33 tons. PANGAEA Internet is available to all commercial customers that are near our fiber route (see our Network Map). If a referral from a current PANGAEA customer results in a signed service agreement, we will credit your PANGAEA invoice $200!!! Click this link to fill out the form. is a recent recipient of a PANGAEA Internet grant. See what John and our other customers have to say on the Testimonial Page of our website. 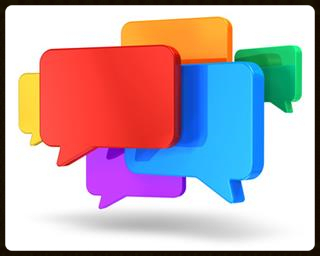 If you haven’t already submitted a customer testimonial, please take a few minutes and give us your feedback. 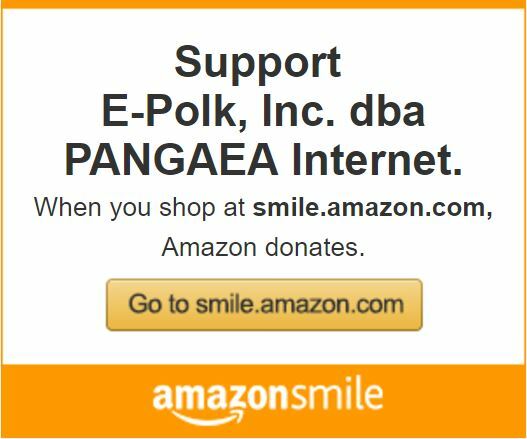 Just click this link and provide a few sentences regarding how PANGAEA Internet has impacted your organization. The drawing is conducted quarterly. 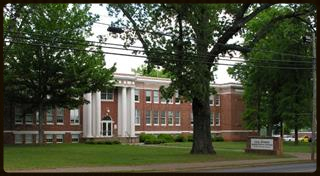 In 2007, PANGAEA constructed a 147 mile fiber optic network that connected all 22 Rutherford County school locations with the Cool Springs administration building in Forest City. 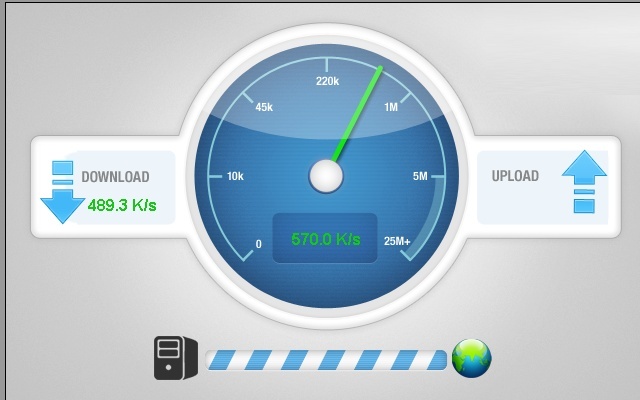 Each connection had a transmission speed of one (1) GBPS (gigabit per second). 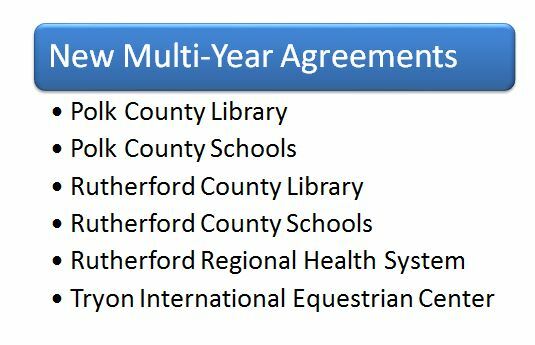 We are proud to announce that every Rutherford County middle and high school has now been upgraded to ten (10) GBPS – a transmission speed once reserved for large urban areas. 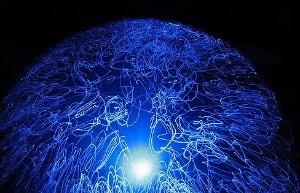 PANGAEA’s “Speed of Light” network makes virtually unlimited speeds possible! Please contact us for an upgraded quote. We are pleased to announce that Ken Griffin has joined the PANGAEA team! Ken has over 20 years of information technology support and management experience. As a network engineer he is responsible for all network equipment, including planning, design, installation, maintenance and repair. 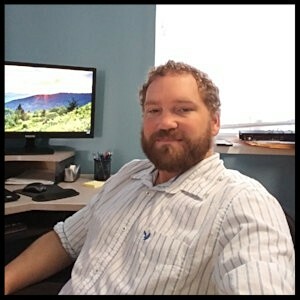 Ken was most recently an Information Technology Director and has held previous positions as a Computer Systems Administrator, a Wide Area Network Administrator, an Infrastructure Administrator and a Team Leader with various companies in North Carolina. 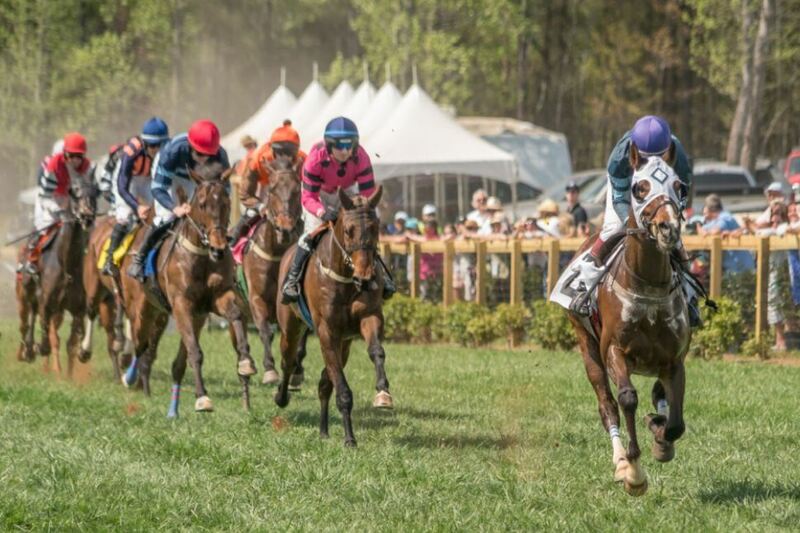 He has a Bachelor of Science degree in Computer Science from UNC – Asheville and lives in Tryon with his wife and daughter. 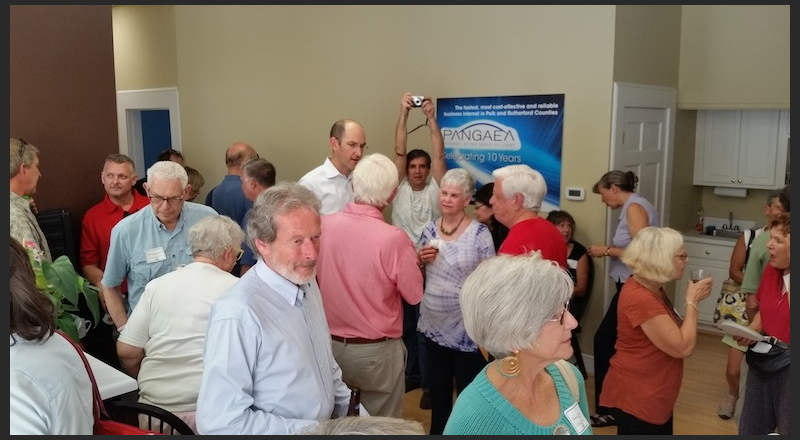 TRYON, NC / August 21, 2015 – PANGAEA Internet (PANGAEA), the leading commercial provider of high-speed fiber optic internet service for Polk and Rutherford Counties, is a non-profit company that is focused on the community, not shareholders. As part of this commitment, PANGAEA is involved in several projects designed to enhance economic development, improve the quality of life, and create a broad platform of innovation enabling underserved areas. Among these projects are multiple efforts to deliver free public Wi-Fi in the PANGAEA service area. 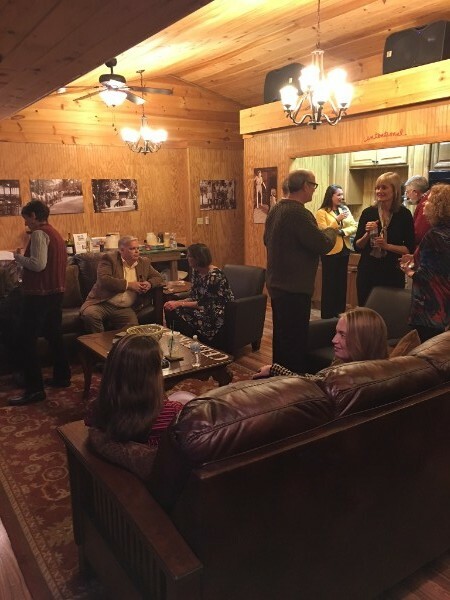 After a successful pilot project brought free Wi-Fi to downtown Tryon, a recent grant from the Appalachian Regional Commission has expanded the project to the downtown business districts of Chimney Rock, Lake Lure, and Saluda. As shown in the accompanying graph, use of the service has grown dramatically during the summer tourist season. Another ongoing Wi-Fi project called “Connect” is a collaboration between PANGAEA, Facebook, the Rutherford County Schools, and the towns of Forest City, Rutherfordton and Spindale. Connect provides free public Wi-Fi service to areas with high concentrations of students, enabling them to take full advantage of Rutherford County Schools’ 1:1 program, which has provided a notebook computer to each middle and high school student since 2011. 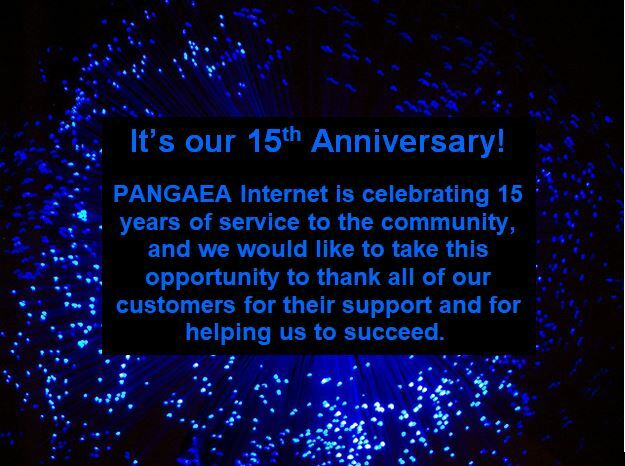 PANGAEA Internet (pan-GEE-ah) is a non-profit provider of high-speed fiber optic internet service. Our network currently serves customers at over 150 locations across Polk and Rutherford Counties, including public school districts, city and county governments, health care facilities, and local businesses. 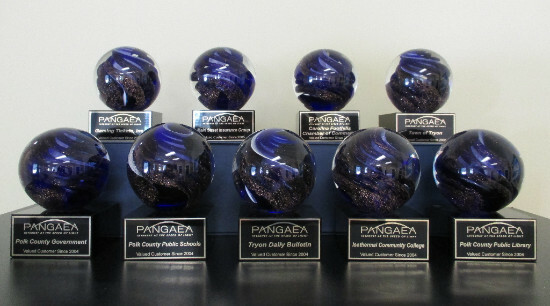 Visit us online at www.pangaea.us, or contact Executive Director Ron Walters at 828-859-3072. PANGAEA is successfully deploying free Wi-Fi in our local communities. Read more about this exciting project in next month’s Press Release. 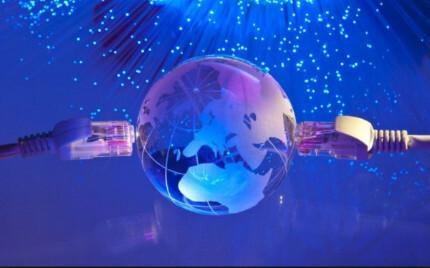 PANGAEA Internet’s grant program is available to assist potential customers with installation costs for our “Speed of Light” fiber optic internet service. Read David’s testimonial on the Testimonial Page of our website. 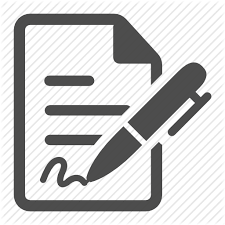 If you haven’t already submitted a customer testimonial, please take a few minutes and give us your feedback. 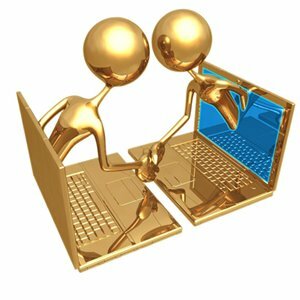 Just click this link and provide a few sentences regarding how PANGAEA Internet has impacted your organization. The drawing is conducted quarterly. Will Gigabit networks or wireless services best meet the needs of the nation’s rural communities? What options are rural communities missing without good-quality broadband? And when commercial providers are in short supply, how do non-profits, cooperatives and municipal broadband providers help fill the void? 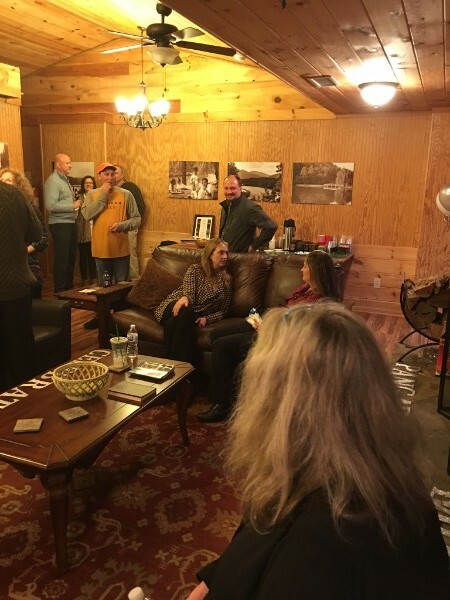 TRYON, NC / April 28, 2015 – PANGAEA Internet (PANGAEA), the leading commercial provider of high-speed fiber optic internet service for Polk and Rutherford Counties, North Carolina, has received the Cornerstone Award from Broadband Communities magazine. The award was presented to PANGAEA Executive Director Ron Walters at the Broadband Communities Summit, held April 14-16 in Austin, TX. 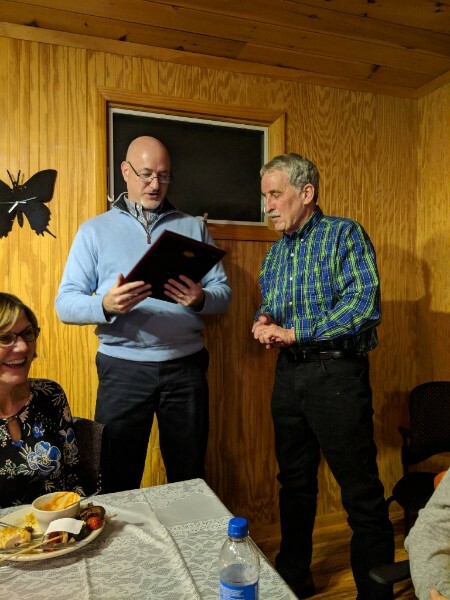 Each year, Broadband Communities assembles a committee of industry leaders, analysts, and writers to honor a select number of recipients for outstanding accomplishments in the area of delivering telecommunications for the benefit of the end user. 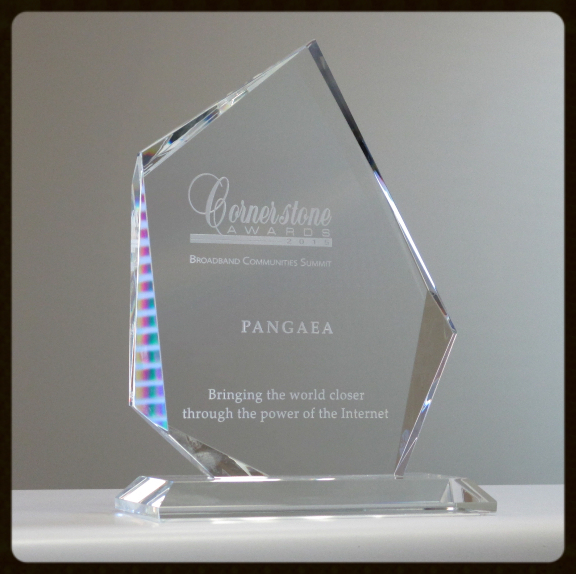 The 2015 presentation marks PANGAEA’s second Cornerstone Award, having also received the award in 2004. 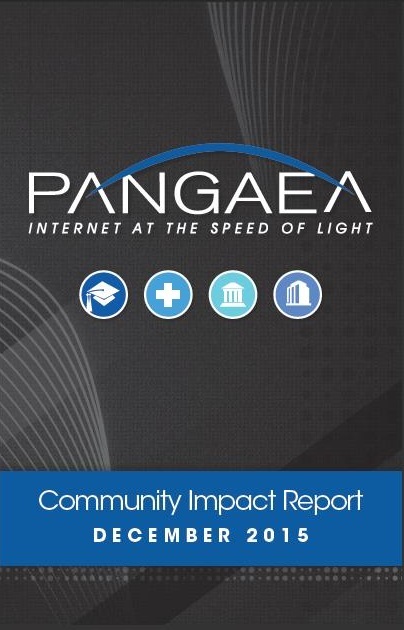 Government – “The local and county governments that are customers of PANGAEA are equipped to communicate with other government entities instantaneously, and to pool resources and reduce costs while improving services.” Judges also noted the impact of PANGAEA Internet on regional economic development, citing PANGAEA’s involvement with the construction of the Facebook data center, the Ameridial call center, and other efforts to support economic growth in Polk and Rutherford counties. 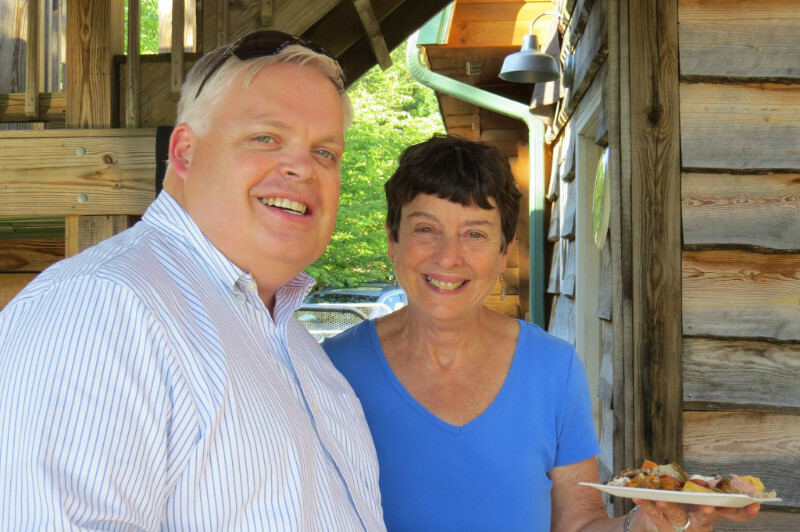 Ron Walters receives the 2015 Cornerstone Award from Jane Patterson, President, The View Forward – Go Forward. 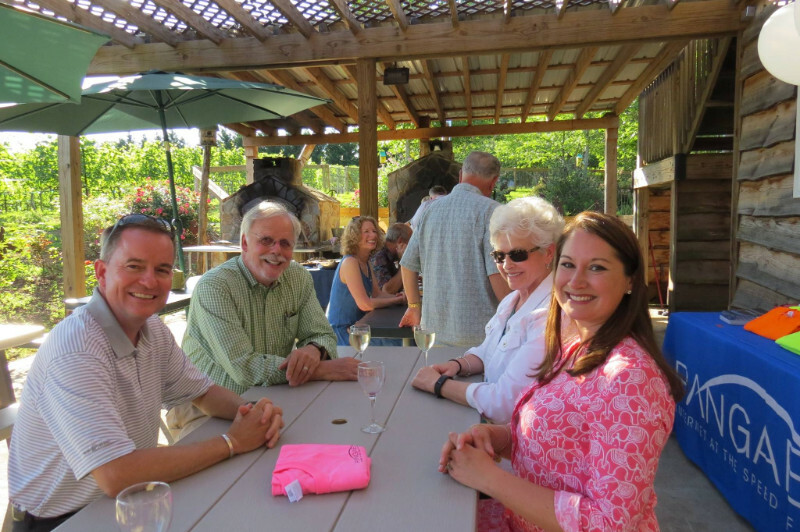 Photo credit: Rachel Ellner for Broadband Communities magazine. Read Wanangwa’s testimonial on the Testimonial Page of our website. 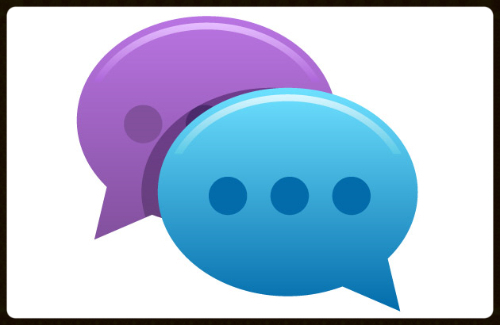 If you haven’t already submitted a customer testimonial, please take a few minutes and give us your feedback. Just click this link and provide a few sentences regarding how PANGAEA Internet has impacted your organization. The drawing is conducted quarterly. 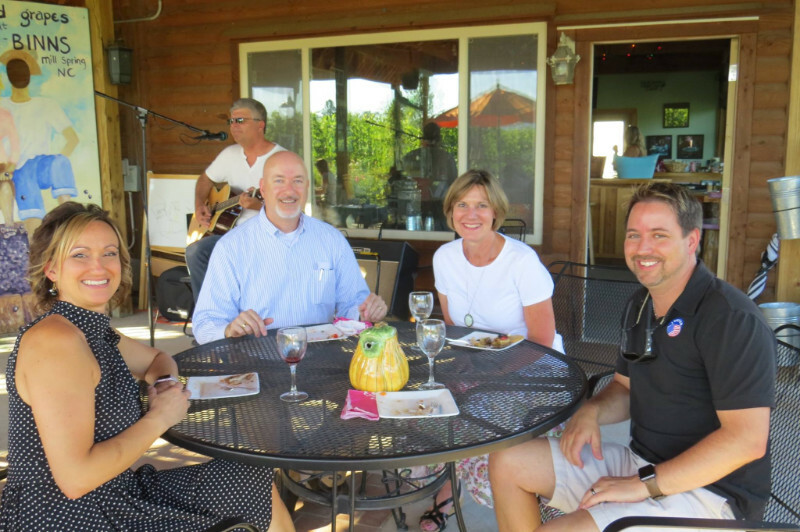 Click above to read the “Fast Friends” story featuring Facebook and Isothermal Community College. “Mutually realizing the need for workers with unique and technical skills, Facebook and Isothermal forged a partnership.” PANGAEA Internet currently provides scholarship funds to eligible Isothermal students attending the College Data Center Institute and Network Technologies programs. When the ribbon was cut on the Facebook data center in Forest City, N.C., a new day was born. Rutherford County, which had “clothed the world,” had seen its textile mills closed and a way of life altered. Unemployment was rampant. Now, with Facebook’s new facility, the county is a place “where the world connects.” It is also a place where Facebook and Isothermal Community College have formed a strong partnership, which is fueled by mutual support and shared purpose. Shortly after the groundbreaking in 2010, 700 construction workers took control of the site, previously the home of a large textile mill that had been razed. It is a safe bet that many of these workers had previously worked in the former mill or another like it in the county. A large portion of the workers — welders, pipe fitters, construction workers and others — had been trained at Isothermal Community College. As the facility has come online and continued to expand, the collaboration between Isothermal and Facebook has grown and deepened through the years, encompassing several initiatives that draw on the community’s strengths. Facebook has found a lot to like in Forest City, N.C. Mutually realizing the need for workers with unique and technical skills to be available to work in the data center, Facebook and Isothermal forged a partnership. Isothermal, which has always been known for its workforce training, created its Data Center Institute with the help of Facebook. Isothermal instructors worked closely with Facebook employees to develop a certification that prepares students to work in one of the area’s most exciting industries. This 12-day workshop focuses on the technical knowledge required of an entry-level data center employee. It is a hands-on experience in an active learning environment. Content is delivered in modular format focusing on technical concepts. This is followed by a two-day simulation and a certification exam. To facilitate instruction, Facebook generously donated a rack of servers along with power equipment to the college to simulate actual data center operations. This was particularly important since the equipment, which is worth hundreds of thousands of dollars, could not be purchased on the open market — certainly not as a teaching aid for a community college. Quite simply, it gave Isothermal students the amazing opportunity to work closely with cutting-edge technology. Walter Dalton (l.), president of Isothermal Community College, and Keven McCammon, site manager of Facebook’s data center in Forest City, discuss the server rack that was donated to Isothermal’s Data Center Institute by Facebook. Since it was first launched, the program has graduated 68 students, nearly all of whom are now working in information technology. This institute earned Isothermal Community College the League of Innovation Award in 2012. The results of the Isothermal Data Center Institute are impressive. Almost half of the students started work as interns at Facebook. Many obtained full-time jobs with the company through its HR service. Jobs that are touted in national and international media as among the most coveted in technology now belong to the citizens of our area. Several of the DCI graduates went to work for other data centers in the region and have credited the credentials earned at Isothermal as giving them an edge in the hiring process. In fact, a manager from a neighboring major data center took the class just to learn best practices and strategies. In 2014, Isothermal and Facebook worked with others to seek grant funding from the U.S. Department of Labor to create the Global Advanced Industrial Technology Consortium (GAITC), a regional consortium of two- and four-year colleges and universities in three states and globally recognized companies, working to enhance and improve advanced industrial technology training and research. It partners rural and urban areas, ignores political boundaries and embraces economic opportunities. It is intended to improve learning, stimulate innovation and save money through economies of scale. Although not successful in the first attempt, the consortium will continue to seek funding from DOL and other sources. If that funding is received, an advanced industrial corridor will be created running from Spartanburg, S.C./Spindale, N.C. to Atlanta, Ga., with the aim of creating jobs through cutting-edge training and new product development and perfection. 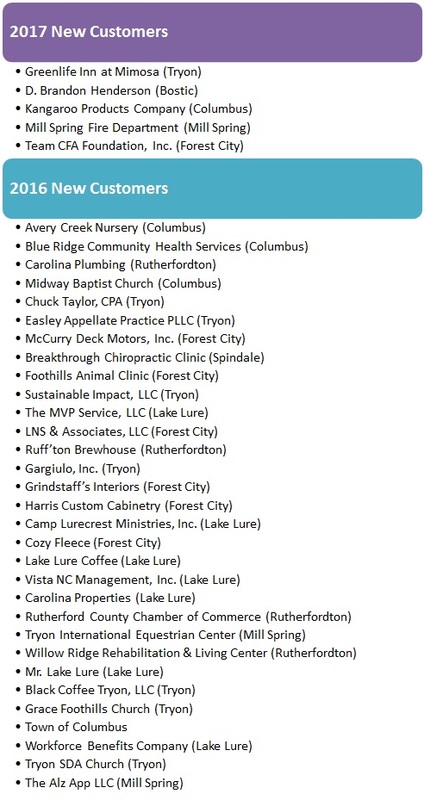 The GAITC partners include North Carolina State University, Spartanburg Community College, Chattahoochee Community College in Georgia, Tri-County Community College in North Carolina, and Western Carolina University, as well as other major companies. “Isothermal” literally means “equal temperature” — the name was given to the college because of Western North Carolina’s Thermal Belt. So it was logical for the college to have a weather station. Facebook made it happen, and with prestigious partners: NOAA (the National Oceanic and Atmospheric Association) and the State Climate Office at North Carolina State University. The station, located on Isothermal’s main campus in Spindale, provides real-time data for use by the scientific community and the public. A Facebook grant of $15,000 covered the major cost of equipment and installation. Most importantly, the data will be available for instruction in Isothermal’s science classes and will also be available for specific study projects by public school students. Ron Walters, executive director of PANGAEA Internet, teaches a recent class at Isothermal Community College’s Data Center Institute. Rutherford County Public Schools made it a priority to ensure that its students have access to technology, and provided each middle school and high school student with a free laptop computer. The problem was, however, that half of the students did not have Internet access at home. 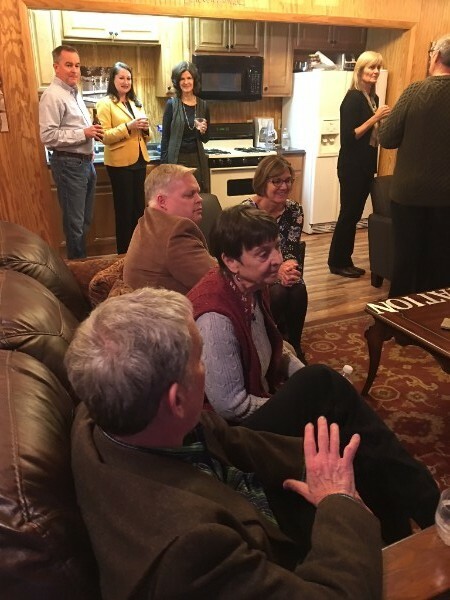 Together with Rutherford County Schools, Isothermal Community College, PANGAEA Internet, and the Town of Forest City, Facebook is working to provide free Wi-Fi to targeted neighborhoods. In Phase I of the project (launched in July 2014), students in 75 to 100 homes were given free Wi-Fi access. In addition to benefiting the local public schools, it will also benefit many Isothermal students who have faced the same access dilemma. At Isothermal, we hope to build a culture focused on STEM (Science, Technology, Engineering and Math), or, as Sam Houston of the Science and Math Technology Center in Raleigh would say, “Strategies That Engage the Mind.” Facebook has stepped up to the plate on both accounts by providing support (financial and otherwise) for Isothermal’s Science and Tech Expo, which is part of the North Carolina Science Festival. The expo brings all of the sixth-graders in a two-county area to the main campus of Isothermal for an entire day to experience nearly 50 interactive exhibits. Lisa Hamrick, a graduate of Isothermal Community College’s Data Center Institute, is now employed at Facebook’s data center, working for contractor Milestone Technologies. 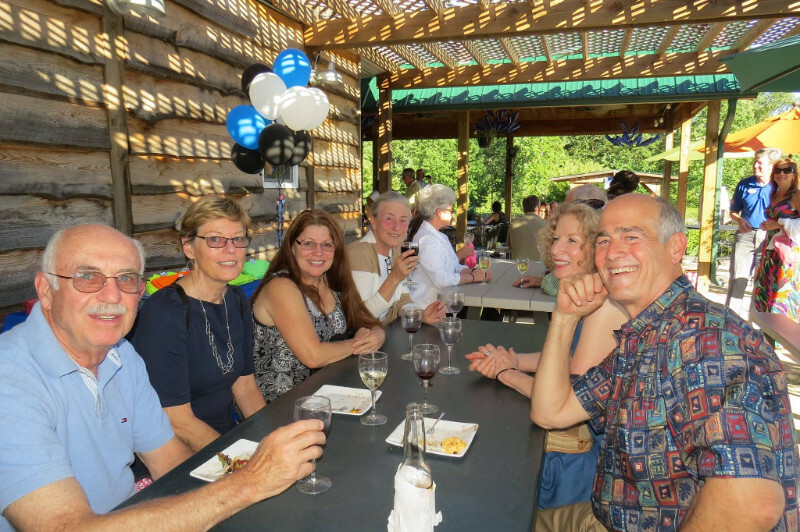 This year Isothermal celebrates its 50th Anniversary. It is 50 years of providing an affordable, accessible and excellent education, and workforce training to our citizens. In addition, we celebrate and appreciate our partnership with Facebook, a relatively new — but powerful and caring — corporate citizen. In only a short time, Facebook has had a significant impact on our local culture and our local economy. While it has a global presence, it is having a tremendous local impact. The Isothermal/Facebook partnership already has paid great dividends, and will continue to grow and thrive through a shared vision for a better future. At Isothermal and in our area, it is safe to say that we “like” Facebook.